Whenever I write about California wines, I get the same old question – what about Israeli wines? Hey do you think to read other posts – or just this one? Do not get me wrong, I love Israeli and French wines, but what can I do, I am a Cali boy and I like California wines just as much. I just posted about Rhone varietal wines, and I missed one that is a really lovely wine – the 2010 Herzog Petite Sirah, Prince Vineyard. I wrote about this wine and the Herzog winery before in this post. However, when we tried it for a Petite Sirah vertical a few year ago – it was not close to what I had at the winery only a few months earlier. Well, I should have posted the Herzog PS in my previous post – but I missed it, so here it is in the Cali wines that I have enjoyed recently. I must start off by saying that Herzog has been killing it recently with its Weinstock and Baron Herzog labels as of recently. These are fantastic wines that are all QPR and mevushal to boot! The 2010 and 2011 Weinstock Petite Sirah, Cellar Select are BOTH lovely and mevushal. The 2010 Weinstock Cabernet Franc, Cellar Select is also lovely (the 2012 is nice but not at the same level), clear QPR winner, and mevushal again. Same goes for the 2012 Baron Herzog Cabernet Sauvignon – a lovely QPR wine, and mevushal of course. That said, the wines I tasted recently were nice, but none of them were at the level I was expecting, especially the 2009 Clone Six Cabernet, which was nice but not close to the awesome 2008 mind-blowing older brother. The Z2 Zinfandel was nice and better than in previous tastings, but not an A level wine still. The 2010 Meritage was truly quite lovely and a mouth coating wine that stays with you. When I think Shirah Winery, I think Rhone varietals, but not this bottle! The 2012 Shirah Coalition is another crazy blend from the Weiss Brothers, and their mad scientist wine lab, called Shirah Winery. This one is a blend of 50% Sangiovese, 20% Dolcetto, 20% Zinfandel from Agua Dolce Vineyards, and 10% Merlot from Agua Dolce Vineyard! Like seriously??? To me I am willing to go out on the limb and say – this is the best kosher Italian wine out there (other than maybe the Falesco wines) – with tongue firmly embedded into cheek. Sure, it is not Italian, but the grapes all grow in Italy, and two of them are indigenous to Italy! Why is the growing region more important than the quality and enjoyability – BRAVO again guys! The two wines from Covenant Winery, were nice but the Chardonnay stole the show. The Landsman was better this time around, but they have yet to steal my breath with the recent releases. The 2009 Lavan was lovely and rich and was a wine that stole my breath and in the end, is less money than the Landsman! Go figure, wine clubs can be a boon for winemakers – as they allow them to experiment in small batches. However, they can also be a place hide mistakes, and though Landsman wines are far from mistakes – recently, the wines feel not quite up to the cost they charge. 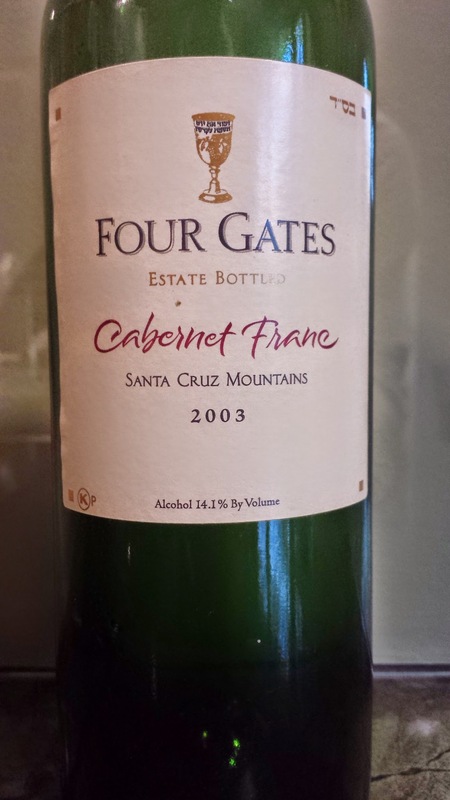 In the end, the wine that stole my breath and my mind was the 2003 Four Gates Cabernet Franc – a wine that shows what California terroir can really do! As always, Benyo, the winemaker at Four Gates Winery, is a friend and many wonder if I bias to high towards his wines. What can I say, I like them, and this wine was a classic example of why I love them so much! When I opened this 11 year old wine, the wine felt hot and sweet, like it was over the hill. However, as the wine opened and air was allowed to blow off the covers of this sleeping giant – the dragon that lay below the sweet fruit notes arose and took my breath away! The clean lines, dark fruit, and green notes were what I crave in a Franc, and it gave me all of that in spades. If you are keeping track, and wondering where Hajdu and his wines were – fear not, they can be found here and also an older vintage here with the Rhone varietals post. Finally, one cannot talk about kosher California wines without talking about the godfather of Cali kosher wines – Hagafen Winery and Ernie Weir. What can I say, I crave good, acidic, and controlled white wines and Ernie is my go-to place for solid and reliable white kosher wines, that just happen to be mevushal! The 2012 White Riesling was as lovely as ever and has more than enough in its tank to keep on shining for a few more years – BRAVO! This was a wine that for the longest time I felt was hot and sweet, but it has turned now and showed a calmer side. The nose on this wine shows deep mineral, dark fruit, herb, green notes, and spice. The mouth on this medium to full bodied wine shines in the fact that the fruit is so focused and bright, with great acidity, lovely concentration, nice mouth coating tannin, sweet cedar, blackberry, plum, raspberry, along with green foliage, and spice. The finish is lovely with fresh anise, bracing mineral, vanilla, chocolate, and hints of tobacco, with graphite and sweet notes lingering long, lovely. The last time we had this wine last year – this wine was over sweet and date driven – not fun at all. This bottle is clearly improved with good structure and controlled fruit. The nose on this purple colored wine starts off with nice black cherry, hints of blue fruit, along with roasted meat, and crazy white pepper, and spice. The mouth is medium to full bodied and round with a searing attack of tannin, cracked pepper, along with classic zinberry fruit that takes over the palate, boysenberry, crazy layers of spices, and mounds of oak. The finish is long and spicy, with nice acid, rich chocolate, leather, an almost saline finish with lovely mineral and bitter notes that linger long. This wine is a commemorative bottle that Herzog has created called Herzog tasting Room Reserve – a wine that is sold only at the tasting room in Oxnard. The wine was made to commemorate the 25th year of wine making under the Herzog wine label. The wine is a blend of Cabernet Sauvignon, Merlot, and Cabernet Franc, the classic melange of French Bordeaux wines. The nose on this red to purple colored wine screams from graphite and mineral, followed by red and black fruit, green notes, herb, and sweet cedar. The mouth on this medium bodied wine starts closed and needs a good hour of decanting to fully enjoy. Once open the mouth is layered with sweet cherry, blackberry, plum, sweet bell pepper, and lovely mouth coating tannin that lingers long. The finish is long and sweet with tart fruit, chocolate, vanilla, leather, spice, and more graphite along with an almost saline finish and bitter almonds that rise on the long and elegant finish – BRAVO!!!! The nose started off nicely with good floral and violet notes, along with blueberry ribbons, smoky aromas, mint, green notes of bell pepper, and lovely passion fruit. The mouth is medium in body with strawberry notes, blackberry, and plum, all wrapped up in a cedar box with lovely mouth coating tannin and anise. The finish is long with smokey notes, vanilla, white pepper, oriental spice, licorice, and slate. The wine was also in a deep slumber for a bit, but it has come out of that sleep and showed quite nicely. WOW! I must start by staying – be brave this wine needs a full two hours of decanting. Ignore your fears and decant!!! After that the sweet notes blow off and the wine opens to express a life that is truly rich and layered and lovely!!! The nose on this wine is rich and perfumed with sweet oak, ripe raspberry jam, blackberry, green notes, and lovely dirt notes. The mouth on this medium to full bodied wine hits you with its rich layers of red and black fruit, mouth coating tannin, green foliage, along with insane acid and rich jammy fruit that has perfectly melded into something that is intense! The finish is long and sweet with lovely fruit, rich leafy tobacco, green fruit, intense mineral, graphite, and spice that lingers long. The tannin, rich acid, sweet jammy fruit, dirt, sweet tobacco, and spice come together into a perfect reality! BRAVO!!! WOW what a lovely wine, I must start by saying that to start this wine was not complex and not fun, however, with air this wine really became the beast that I expected, I recommend you decant this wine for an hour or more. The nose on this wine is rich and gold and lovely with ripe fruit and sweet oak and depth that is truly impressive, with a floral perfume, butterscotch, and spice. The mouth on this full bodied wine is truly impressive and layered with rich fruit, peach, apricot, kiwi, and melon, all wrapped up in layers of sweet wood and and fresh apple pie and bricohe. The finish is long and rich, with core bracing acid, nice spice, and sweet nutmeg that lingers long – BRAVO!!! This wine was clearly in a dead zone for a bit, but has now comfortably come out of that and is showing very well indeed. The nose on this dark purple and brooding colored wine starts off with a BAM of blueberry liquor, something that is impossible to miss, followed by boysenberry, rich blackberry, raspberry, and spice. The mouth on this rich and medium bodied wine starts off with an attack of rich massive tannin, rich and velvety, with concentrated, sweet, and focused blue and black fruit that mimics the nose along with root beer, intense anise, Oriental spice, and enough oak to round the fruit, with all the components coming together nicely. The finish is super long and rich, that has an air of completeness while still being firm and concentrated, with graphite, mineral, along with hints of roasted meat, rich espresso, chocolate, and vanilla. The wine is back but it is time to drink up and be merry! This is another of the classic chutzpah wines that have become the trademark of the Coalition wines. I think they should rename them to Chutzpah as the blends are never the same and always VERY much out there! This time it is a blend of 50% Sangiovese, 20% Dolcetto, 20% Zinfandel from Agua Dolce Vineyards, and 10% Merlot from Agua Dolce Vineyard (where the boys worked for part of 2012). This wine starts off hot and sweet to start after opening but with time, the heat goes away as does the sweet notes. The nose on this purple colored wine is rich with sweet spice, currant, root beer, blue fruit, and herb. Once the wine opens and the sweet notes go the wine opens to layers and layers of lovely concentrated fruit, candied boysenberry, raspberry, blackberry, and strawberry, all wrapped up in intense mouth drying tannin, sweet cedar, with lovely anise and licorice. The finish is long and sweet and herbal, with green notes, bell pepper, lovely graphite, mineral, loamy dirt, and lovely spice, but the soft leather, still mouth coating and gripping tannin take center stage with blue and red fruit, with nutmeg and cinnamon. Lovely! This wine continues to impress me and one that I never get tired of. It is a step beyond simple quaffer, with great balance of 2% residual sugar and great acidity, controlled with lovely tropical fruits. The nose starts off with sweet notes or tropical fruit, clear honeysuckle commands the nose, with pineapple, and candied grapefruit taking the side stage. The mouth is rich and layered and truly captivating with an almost oily texture from the sugar, along with banana, peach, more tropical fruits, along with tart white cherry. The finish is long and sweet with a great balance of tart to sweet fruit, sour red apple, and guava. Bravo! No change from before lovely! Posted on May 18, 2014, in Kosher Red Wine, Kosher White Wine, Kosher Wine, Wine and tagged Cabernet Franc, Cabernet Sauvignon, Chalk Hill, Chardonnay, Clone Six, coalition, Covenant Winery, Four Gates Winery, Hagafen Winery, Herzog Cellars Winery, Landsman, Lavan, Meritage, Petite Sirah, Shirah Winery, White Riesling, Z2, Zinfandel. Bookmark the permalink. Leave a comment.